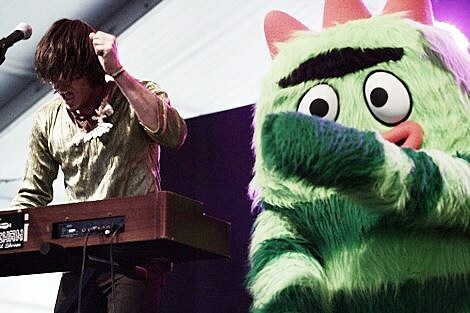 By all accounts Yo Gabba Gabba‘s first tour in the fall was a big success. That included three nights at NYC’s Beacon Theatre which featured Dinosaur Jr, the Roots and Devendra Banhart as guests. At Coachella, characters from the show joined King Khan & The Shrines on stage, and rocked out to the Specials and others. They’ll be back at the end of this summer for a 60-date tour that runs through December. It kicks off August 27th at Bethel, NY’s Bethel Woods Center for the Arts (where they’ll do two shows) and includes a two-day run at Radio City (Oct 2-3) into which they’ll pack five shows. Tickets go on AmEx presale Thursday at 10am. Internet presale starts June 2nd at 10am. General sale starts Saturday, June 5th at 10am. One dollar from each of the ticket sales will be going to Habitat for Humanity (similar to what MMJ are doing). They’re also having an invite-only dance party DJ’d by Lance Rock at Brooklyn Bowl on Thursday May, 20th to celebrate the North American tour and partnership. Cast members will be in attendance.